Minted from 1916-1945, the Mercury Dime is a 90% silver coin and this roll of 50 coins is in Extra Fine to Almost Uncirculated condition. 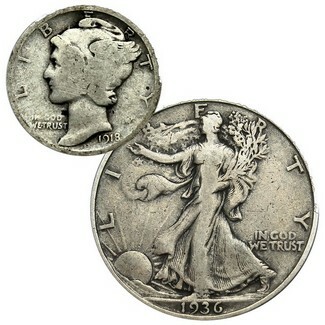 includes: (20) 90% Silver Walking Liberty Half Dollars from 1935 - 1945 in Extra Fine to Almost Uncirculated Condition. Our Choice of Selection at Random.